Jeremy Brecher's historical account of the general strike and takeover of the city by workers in Seattle in 1919. For some time these little pamphlets were seen by hundreds on Seattle's streetcars and ferries, read by men of the shipyards on their way to work. Seattle's business men commented on the phenomenon sourly; it was plain to everyone that these workers were conscientiously and energetically studying how to organize their coming power. A general strike directed at WHAT? The Government of the United States? Bosh! Yet within a day eight local unions endorsed the strike at their regular meetings - most of the votes nearly unanimous. Within two weeks 110 locals had voted for the strike, even some of the more conservative doing so by margins of five and ten to one. In joining the strike, the workers knew that they were risking more than a few days' pay. First, they risked punishment from their own internationals; and second, the loss of established contracts with their employers. For example, the Longshoremen's Union imperiled (and eventually lost) a closed-shop agreement for the Seattle waterfront, and the president of the International Longshoremen's Association wired the local that he would rescind its charter if it took part in the general strike. The Central Labor Council agreed that the strike be run by a General Strike Committee of three members from each striking local, elected by the rank and file. 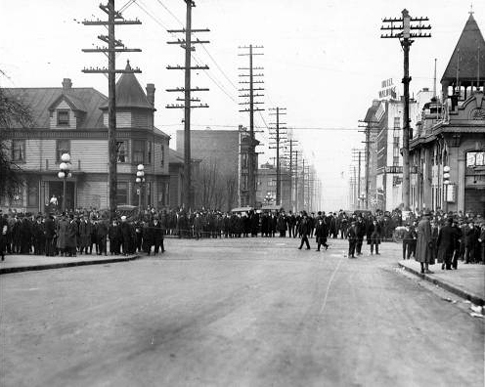 The 300 members of the committee - mostly not officials but rank-and-filers with little previous leadership experience-started meeting four days before the strike; they and their fifteen-man executive committee were in daily session throughout the strike, forming virtually a counter-government for the city. Shipyard workers in Seattle in 1919 found themselves locked out by order of the U.S. government. Other Seattle workers felt this was the start of an attack on them as well. It was this sentiment that made them willing and eager to turn to the tactic of a general strike. Workers in various trades organized themselves to provide essential services with the approval of subcommittees of the executive committee, which granted them exemptions from the strike. "King county commissioners ask for exemption of janitors to care for City-County building. Not granted. "F.A. Rust asks for janitors for Labor Temple. Not granted. "Teamsters' Union asks permission to carry oil for Swedish Hospital during strike. Referred to transportation committee. Approved. "Port of Seattle asks to be allowed men to load a government vessel, pointing out that no private profit is involved and that an emergency exists. Granted. "Communication from House of Good Shepherd. Permission granted by transportation committee to haul food and provisions only." In some cases, workers improvised large-scale operations from scratch. For instance, the milk wagon drivers initially proposed to their employers that certain dairies remain open, but when the employers refused to open them except downtown, and attempted to take direction of the plan, the drivers decided to organize their own distribution system instead. They set up thirty-five neighborhood milk stations, purchased milk from small dairymen near the city, and distributed it throughout the city. Even more impressive was the commissary department, which served 30,000 meals a day to the strikers and community. The cooks, waiters and other provision trade workers purchased the food, located restaurant kitchens, and arranged to transport the cooked food to twenty-one eating places in halls throughout the city. This huge operation was running smoothly by the second day of the strike. On Thursday at 10 A.M.- There will be many cheering, and there will be some who fear. We are undertaking the most tremendous move ever made by LABOR in this country, a move which will lead-NO ONE KNOWS WHERE! The milk-wagon drives and the laundry drivers are arranging plans for supplying milk to babies, invalids and hospitals and taking care of the cleaning of linen for hospitals. The strike committee is arranging for guards and it is expected that the stopping of the cars will keep people at home. NOT THE WITHDRAWAL OF LABOR POWER, BUT THE POWER OF THE STRIKERS TO MANAGE WILL WIN THIS STRIKE. What does Mr. Piez of the Shipping Board care about the closing down of Seattle's shipyards, or even of all the industries of the northwest? Will it not merely strengthen the yards at Hog Island, in which he is more interested? When the shipyard owners of Seattle were on the point of agreeing with the workers, it was Mr. Piez who wired them that, if they so agreed - HE WOULD NOT LET THEM HAVE STEEL. Whether this is camouflage we have no means of knowing. But we do know that the great eastern combinations of capitalists COULD AFFORD to offer privately to Mr. Skinner, Mr. Ames and Mr. Duthie a few millions apiece in eastern shipyard stock, RATHER THAN LET THE WORKERS WIN. BUT, the closing down of the capitalistically controlled industries of Seattle, while the WORKERS ORGANIZE to feed the people, to care for the babies and the sick, to preserve order- THIS will move them, for this looks too much like the taking over of POWER by the workers. Labor will not only SHUT DOWN the industries, but Labor will REOPEN, under the management of the appropriate trades, such activities which are needed to preserve public health and public peace. If the strike continues, Labor may feel led to avoid public suffering by reopening more and more activities, UNDER ITS OWN MANAGEMENT. I hereby notify you that unless the sympathy strike is called off by 8 o'clock tomorrow morning, Saturday, February 8, 1919, I will take advantage of the protection offered this city by the national government and operate all the essential enterprises. The limitations of a general strike now became apparent. The point had come where either the strikers had to try to make permanent the power they had taken over the organized life of the city-an act of revolution which would have meant an immediate military confrontation - or capitulate. This situation was dramatized when the Executive Committee voted thirteen to one to recommend on Saturday, February 8th, to end the strike that night. The 300 members of the General Strike Committee were almost persuaded until they took a supper break and talked with members of their own rank and file; they returned to the meeting and voted overwhelmingly to continue the strike. The immediate effect of the strike was inconclusive. The shipyard strike went on; the attack on unionism swelled in Seattle as elsewhere; the Socialist Party headquarters, a labor printing plant, and the I.W.W. hall were raided and thirty-nine "Wobblies" - l.W.W. members - arrested as "ringleaders of anarchy,"27 Although they played little role in the general strike. They are singularly alike in nature. Quiet mass action, the tying up of industry, the granting of exemptions, until gradually the main activities of the city are being handled by the strike committee. Apparently in all cases there is the same singular lack of violence which we noticed here. The violence comes, not with the shifting of power, but when the "counter revolutionaries" try to regain the power which inevitably and almost without their knowing it passed from their grasp. Violence would have come in Seattle, if it had come, not from the workers, but from attempts by armed opponents of the strike to break down the authority of the strike committee over its own members. 1. Sylvia Kopald, Rebellion in Labor Unions (N.Y.: Boni and Liveright, 1924), p. 152. 2. Robert L. Friedheim, The Seattle General Strike (Seattle: University of Washington Press, 1964), p. 18. 4. William Short, History of Activities of Seattle Labor Movement and Conspiracy of Employers to Destroy It and Attempted Suppression of Labor's Daily Newspaper, the Seattle Union Record (Seattle: Union Record Publishing Co., 1919), pp. 1-2, cited in Friedheim, p. 24. 5. Papers on Industrial Espionage (Mss. in University of Washington Library, Seattle), report of Agent 106, June 11, 1919, cited in Friedheim, p. 29. 6. Anna Louise Strong, I Change Worlds (N.Y.: Henry Holt and Co., 1935), p.68. 7. Seattle Times, Jan. 21, 1919, p. 1, cited in Friedheim, p. 75. 9. Ibid., pp. 72, 74. 10. Seattle Times, Jan. 28, 1919, cited in Freidheim, p. 84. 11. History Committee of the Seattle General Strike Committee, The Seattle General Strike (Seattle: The Seattle Union Record Publishing Co., Inc., 1920), p. 15. 13. William MacDonald, "The Seattle Strike and Afterwards" (written in Seattle, Feb. 28,1919), in The Nation, Mar. 29, 1919, cited in Wilfrid H. Crook, Communism and the General Strike (Harnden, Conn.: The Shoe String Press, Inc., 1960), p. 53. 14. History Committee, pp. 21-2. 18. Ole Hanson, Americanism versus Bolshevism (Garden City, N.Y.: Double- day, Page, 1920), p. 84, cited in Freidheim, p. 123. 20. History Committee, p. 46. 21. New York Times, February 9, 1919, cited in Crook, p. 51. 22. For a photocopy of the original, see State's Exhibit 40, transcript of People v. Lloyd, p. 467; Harvey O'Connor claims authorship of "Russia Did It," in Revolution in Seattle (N.Y.: Monthly Review Press, 1964), p. 143, cited in Freidheim, p. 10 1. 23. Reprinted in Daily Bulletin, Feb. 8, 1919, p. 1, cited in Freidheim, p. 136. 25. History Committee, p. 38. Missed this before. Thanks for posting - nothing to add at the moment but will come back to this. Seattle (and Winnipeg) need to be seen in context and more widely known about (not just by a handful of working-class history nerds).